A tourist attraction in Bristol has received a special award recognising Brunel's ss Great Britain as Europe's top industrial museum for 2007. 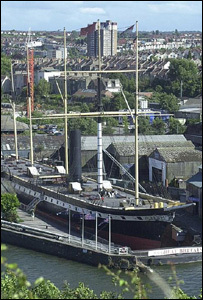 Although it did not win European Museum of the Year, the ss Great Britain Trust said being short-listed for it meant it was "among the best" in Europe. "We were up against museums with state funding. It's great to have reached the finals," Nancy Chambers said. The announcement was made at a ceremony in Alicante, Spain. Organisers of the prize, the European Museum Forum, presented the industrial museum award to the ss Great Britain Trust's Director Matthew Tanner MBE. The awards recognised its contribution to heritage, conservation, education, access and tourism. In April the ss Great Britain was crowned the best large tourist attraction in the country at the tourism "Oscars". More than 200,000 visitors flocked to the attraction in Bristol Docks last year.